Gift of Mr. and Mrs. John Adam, Jr.
One of the leading painters of religious and mythological subjects at the beginning of Holland's Golden Age, Lastman is also recognized as the principal teacher of Rembrandt. He is the most accomplished of a group of artists often called the "pre-Rembrandtists," who were skilled at portraying narrative scenes. Their goal was to illustrate stories in a straightforward fashion, often using expressive gestures and naturalistic elements. Lastman painted at least three versions of this subject, which comes from an ancient Greek legend. 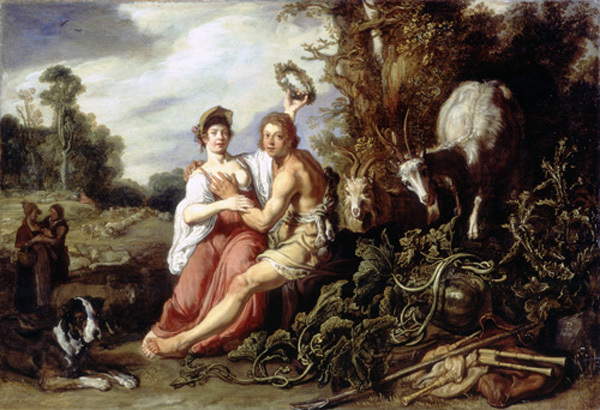 Paris, who had been raised by shepherds, makes love to the nymph Oenone, who in turn bestows on him a floral wreath, signifying her consent to giving up her virginity. The young couple is surrounded by elements relating to the theme of love. The dog and the embracing figures at the left symbolize fidelity, while the goats, melon, and bagpipes on the right all represent sexual activity. The right-hand elements forecast the fate of this young couple, whose marriage ended when Paris deserted Oenone for Helen of Troy.